"St. James Place" redirects here. It is not to be confused with St James's Place or a property of the same name in the board game Monopoly. Bridge of Spies was shot under the working title of St. James Place. Principal photography began on September 8, 2014, in Brooklyn, New York City, and the production proceeded at Babelsberg Studios in Potsdam. The film was released by Touchstone Pictures on October 16, 2015, in the United States and distributed by 20th Century Fox in other countries. It was a box office success, grossing $165 million worldwide, and was praised for its screenplay, Hanks and Rylance's performances, Spielberg's direction, musical score, and production values. The film received six Academy Award nominations including Best Picture and Best Original Screenplay, and won Best Supporting Actor for Rylance. In 1957 New York City, Rudolf Abel is arrested and charged with spying for the Soviet Union. Insurance lawyer James B. Donovan is prevailed upon to take on the unenviable task of defending Abel, so that Abel's trial will be seen as fair. Committed to the principle that the accused deserves a vigorous defense, he mounts the best defense of Abel he can, declining along the way to cooperate in the CIA's attempts to induce him to violate the confidentiality of his communications with his client. Abel says Donovan reminds him of a friend of his father's who used to visit; "Watch this man," his father said. When State thugs came in and beat his parents and this friend, the friend kept getting to his feet; "Stoikiy muzhik", they said – "Standing man" – and let him live. Abel is convicted, but Donovan convinces the judge to spare Abel the death penalty because Abel had been serving his country honorably, and he might prove useful for a future prisoner exchange; Abel is sentenced to 30 years. Donovan appeals the conviction to the Supreme Court based on the lack of a search warrant for the seizure of Abel's ciphers and photography equipment. For his principled stand Donovan and his family are harassed, including shots being fired at their home. The conviction is upheld. In 1960, Gary Powers, a pilot in the CIA's top secret U-2 spy plane program, is shot down over the USSR. He is captured and sentenced in a show trial to ten years confinement, including three years in prison. Donovan receives a letter from East Germany, purportedly sent by Abel's wife, thanking him and urging him to get in contact with their lawyer, whose name is Vogel. The CIA think this is a back-channel message hinting that the USSR is willing to swap Powers for Abel. They unofficially ask Donovan to go to Berlin to negotiate the exchange; he arrives just as the Berlin Wall is going up. Crossing in to East Berlin, he meets with a KGB officer in the Soviet Embassy and is then directed to Vogel, who represents the Attorney General of the German Democratic Republic (GDR). The Attorney General seeks to swap Abel for an American graduate student named Frederic Pryor, who had been arrested in East Germany; in the process the GDR hopes to gain official recognition by the United States. The CIA wants Donovan to forget about Pryor but he insists that both Pryor and Powers be swapped for Abel. In a message to the Attorney General he bluffs that they will either release Pryor with Powers or there will be no deal. The exchange of Powers and Abel takes place at the Glienicke Bridge, with Pryor to be released simultaneously at Checkpoint Charlie. Donovan asks Abel what he thinks will happen upon his return to the Soviet Union; Abel answers that his fate – whether he is to be welcomed back as a hero or shot as a traitor – will be obvious from whether he is embraced by the Soviet agents at the end of the bridge or simply shown into the back seat of a car. There is a tense wait for word of Pryor’s release at Checkpoint Charlie. The CIA, still primarily concerned with Powers, tell Abel he can go, but he turns to Donovan and says "Stoikiy muzhik" – "Standing man" – and refuses to move. The bluff is successful. It is confirmed that Pryor has been released, and the exchange takes place. Donovan watches as Abel is received by the Soviet agents; he is shown into the back of a car without embrace. The next day, back in the United States, the government publicly acknowledges Donovan for negotiating the deal that rehabilitates his public image. Alan Alda as Thomas Watters Jr.
Bridge of Spies is an American-German co-production based on a script written by the Coen Brothers and Matt Charman. Studio Babelsberg co-produced and oversaw production services for the film. James Donovan wrote an account of the incident in 1964 under the title Strangers on a Bridge: The Case of Colonel Abel and Francis Gary Powers. The historical background to the U-2 incident and the story of former West Berlin CIA chief William King Harvey and Operation Gold was published in Rory MacLean's Berlin: Portrait of a City Through the Centuries (2014). Soviet intelligence officer Rudolf Abel, who lived and operated in Brooklyn Heights, did dead drops of stolen documents in Prospect Park. His arrest and history were discussed by Truman Capote, another Heights resident at the time, in his book A House on the Heights. Matt Charman became interested in Donovan's story after reading a footnote about him in An Unfinished Life: John F. Kennedy, 1917–1963. After meeting with Donovan's son in New York City, Charman pitched the story to several studios and DreamWorks bought it. Studio co-founder Steven Spielberg became interested in the film and decided to direct. Marc Platt and Kristie Macosko Krieger attached themselves as producers along with Spielberg. Joel Coen and Ethan Coen revised Matt Charman's original script. According to Charman, the brothers "were able to really punch up the negotiations on the back end of the movie, then they handed the baton back to me to do a pass after they did their pass, to make the movie just sit in a place we all wanted it to. The flavor they brought is so fun and enjoyable. It needed to be entertaining but truthful." In May 2014, it was announced that Tom Hanks would star as James Donovan, with Mark Rylance co-starring as Abel. Amy Ryan, Alan Alda, Billy Magnussen, and Eve Hewson were reported to star in the film as well. Participant Media co-produced the film. Francis Gary Powers, Jr., founder of The Cold War Museum and the pilot's son, was brought on as a technical consultant and has a cameo in the film. In June 2014, Fox 2000 Pictures agreed to co-finance the film with DreamWorks and Participant Media, with the film's distribution rights being divided between Disney and Fox. During a March 3, 2015, interview with The Daily Pennsylvanian, Platt revealed the title to be Bridge of Spies; it was shot under the working title of St. James Place. The film also received funds of €3.7 million, from the German Federal Film Fund (DFFF). Principal photography began on September 8, 2014, in Brooklyn, New York City. On September 14, filming took place in DUMBO, a Brooklyn neighborhood, where crews transformed Anchorage Street to appear as it did in the 1960s. On September 15, filming took place in Astoria, between Astoria Park and Ditmars Boulevard. Filming was done on 18 Street and 26 Avenue in Astoria, where Spielberg was spotted transforming the 5 Corners Deli into a 1950s grocery store. On September 26, filming took place on 44th Street in Manhattan, as evidenced by crews stationed on 44th Street, between Madison and 6th Avenues. On September 27, Hanks was spotted filming scenes on Wall Street among extras wearing 1960s costumes. 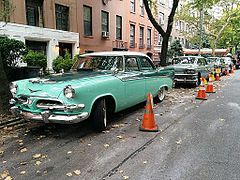 On September 28, filming of some day and night scenes took place on the corner of Henry Street and Love Lane in the Brooklyn Heights neighborhood of Brooklyn, where the block was set with vintage cars, street signs, rain machines, and spotlights. On September 29, filming took place on Hicks Street and Pineapple Street, where a shop, Perfect Paws, was transformed into a 1960s dress shop named Brooklyn Pearl, and at the NYS Appellate Division courthouse on Monroe Place and Pierrepont Street. On October 6, Hanks and the crew were spotted on the same location on Hicks Street. The scene in the Court hallway in which Hanks, to Alda's consternation, announces his intention to appeal the guilty verdict, was filmed on the first floor on the Queens County Supreme Courthouse at 88-11 Sutphin Blvd., Jamaica, New York. In early October, after filming wrapped in New York City, further production began at Babelsberg Studios in Berlin and Potsdam, Germany, and would last there through the end of November. Filming in Berlin began with shooting at the former Tempelhof Airport in October, for scenes that actually took place there, such as Donovan's descending from an historic C-54 Skymaster. The prisoner exchange scene was filmed on the Glienicke Bridge (the so-called "Bridge of Spies"), where the historical exchange actually took place in 1962. The bridge spans the Havel narrows between Berlin and Potsdam, and was closed to traffic for filming over the last weekend of November. German Chancellor Angela Merkel visited the set to watch the filming of these scenes. Principal photography officially ended on December 4, at Berlin Tempelhof. Shooting also took place in Wrocław, Poland, in the second half of November. During mid-December, filming took place at Beale Air Force Base, located near Marysville, California. The film was shot on 35mm motion picture film, including Kodak Vision3 250D Color Negative Film 5207 and Vision3 500T Color Negative Film 5219. Bridge of Spies is based on the real-life events. The film, however, departs from the historical record, though reviewers have praised the film and argued that such departures are permissible. Commentators have noted that the shortening of timespans in the film at times gives a misleading impression. One key example is the depiction of the Berlin Wall. Donovan did not see Berlin wall escapees being shot; the shootings most similar to the ones depicted were those associated with the killing of Peter Fechter that happened the summer after the Powers/Abel exchange on the Glienicke Bridge. Similarly, the circumstances of Frederic Pryor's detention were not accurately portrayed – he could not have crossed a partially built wall, and further, was convicted of obtaining "confidential" material. Apart from the depiction of the Wall, it is notable that Donovan did not suffer quite the extent of violence depicted: he was not shot at in his home, and he did not have his overcoat stolen. The film also changed the location of Donovan's suggestion to the judge to spare Abel for the sake of a possible future exchange, which was in fact made in open court. Donovan is presented in the film as a private practice attorney with little connection to the government or the intelligence community. In reality however, during WWII Donovan served as the general counsel of the OSS, shortly before it was re-organized as the CIA. Abel, an English-born Soviet intelligence officer (whose real name was William G. Fisher) most likely did his best work for the Soviet Union not as a spy in a dishevelled New York City lair full of radio gear, but before and during World War II, when he trained agents and radio operators for clandestine work in German-occupied regions. This training is thought to have been critical to what his mentor, Pavel Sudoplatov, later called one of the most important radio deception operations of the war. Frederic Pryor stated in an interview that various details of the plot related to his involvement were incorrect. He did not cross the Berlin wall during its construction, as he was on vacation in Denmark at the time. He was detained after his return, when he crossed into East Berlin to visit a friend's sister; she had fled to West Berlin using "some sort of passport manipulation", and her apartment was under surveillance to catch anyone attempting to retrieve its contents. Pryor also stated that the film's depiction of Wolfgang Vogel was unfair. The film depicts the shooting down of Powers' U2 plane as occurring after a single volley of three SAMs, however, more than 14 were launched. A MiG-19 fighter that was scrambled to intercept the plane was also shot down by friendly fire during this salvo, killing the pilot Sergei Safronov. The theatrical poster for the film was released on June 4, 2015, with the first trailer appearing online the following day. It was distributed in North America by Walt Disney Studios Motion Pictures, through the Touchstone Pictures banner. Disney held the film's world premiere on October 4, 2015 at the 53rd annual New York Film Festival. The film went into general theatrical release in the United States on October 16, 2015. 20th Century Fox distributed the film in the remaining international territories. However, Disney acquired 20th Century Fox on March 20, 2019 and as a result now handles global distribution rights to the film. The film was released by Touchstone Home Entertainment on Blu-ray, DVD, and digital download in North America on February 2, 2016 and by 20th Century Fox Home Entertainment in other territories. Bridge of Spies grossed $72.3 million in North America and $93.3 million in other territories for a worldwide total of $165.6 million, against a budget of $40 million. In the United States and Canada, pre-release tracking predicted Bridge of Spies to open to around $15–20 million from 2,811 theaters. The film opened alongside Goosebumps, Crimson Peak, and Woodlawn on October 16, 2015, facing particular competition from the former, and also from The Martian, which was entering its third week. The film made $500,000 from its early Thursday night showings and $5.3 million on its first day. In its opening weekend, the film grossed $15.4 million, finishing third at the box office behind Goosebumps ($23.5 million) and The Martian ($21.5 million). Its biggest international markets have been Italy ($12.1 million) and United Kingdom (11.0 million). Bridge of Spies received critical acclaim. Richard Roeper of Chicago Sun Times gave the film four out of four stars and praised Spielberg's direction, saying: "Spielberg has taken an important but largely forgotten and hardly action-packed slice of the Cold War and turned it into a gripping character study and thriller that feels a bit like a John Le Carre adaptation if Frank Capra were at the controls". Michael Phillips of the Chicago Tribune called the film a "a confident, slightly square, highly satisfying example of old-school Hollywood craftsmanship, starring a major movie star brandishing a briefcase, and a handkerchief, rather than a pistol". The A.V. Club's Ignatiy Vishnevetsky described it as "one of the most handsome movies of Spielberg's latter-day phase, and possibly the most eloquent [...] Bridge of Spies turns a secret prisoner exchange between the CIA and the KGB into a tense and often disarmingly funny cat-and-mouse game". On the other hand, Mike Scott of New Orleans Times-Picayune, had a more mixed reaction, saying: "Bridge of Spies, with its stop-and-go momentum, is also more merely interesting than it is full-on riveting. It's still quite good stuff, but despite its impressive pedigree... it doesn't feel as if it's quite the sum of all of its parts". Preston Jones of Fort Worth Star-Telegram gave the film 2 and a half stars out of five. Jones wrote that "For all Spielberg, his star-packed cast, led by Tom Hanks, and his on-screen and off-screen team (Joel and Ethan Coen co-wrote the screenplay) bring to the table, Bridge of Spies is remarkable only for how stuffy and surprisingly inert the film becomes". On Rotten Tomatoes, the film has a rating of 91%, based on 283 reviews, with an average rating of 7.7/10. 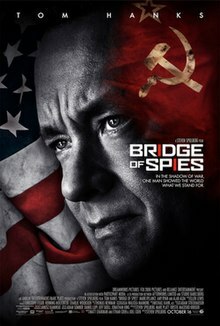 The site's critical consensus reads, "Bridge of Spies finds new life in Hollywood's classic Cold War espionage thriller formula, thanks to reliably outstanding work from Steven Spielberg and Tom Hanks". On Metacritic, the film has a score of 81 out of 100, based on 48 critics, indicating "universal acclaim". On CinemaScore, audiences gave the film an average grade of "A" on an A+ to F scale. Frequent Spielberg collaborator John Williams was originally announced to compose the film's score. However, Williams had to drop out of production due to a health issue. Per a suggestion by Williams, Thomas Newman was then contacted by Spielberg to replace Williams, marking Spielberg's first film without Williams' music since 1985's The Color Purple, which was scored by Quincy Jones. Hollywood Records released the film's soundtrack on October 16, 2015. All music composed by Thomas Newman. ^ "Bridge of Spies Press Kit" (PDF). wdsmediafile.com. The Walt Disney Studios. Archived (PDF) from the original on December 14, 2015. Retrieved December 14, 2015. ^ "BRIDGE OF SPIES (12A)". British Board of Film Classification. October 13, 2015. Retrieved October 13, 2015. ^ Debruge, Peter (October 4, 2015). "Film Review: 'Bridge of Spies'". Variety. Retrieved October 6, 2015. ^ a b "Bridge of Spies (2015)". Box Office Mojo. Retrieved March 10, 2016. ^ Barraclough, Leo (October 23, 2014). "Steven Spielberg to Shoot Scenes for Cold War Thriller in Poland: Report". Variety. Los Angeles: Penske Media Corporation. Retrieved April 7, 2016. ^ Lang, Brent (March 18, 2015). "Spielberg-Hanks Cold War Film Titled 'Bridge of Spies,' John Williams Won't Compose Score". Variety. Retrieved March 19, 2015. ^ "Steven Spielberg to Shoot Scenes for Cold War Thriller in Poland: Report". Variety. Retrieved April 7, 2016. ^ "Steven Spielberg in Wrocław" (Press release). Breslau: Official website of Wrocław. October 24, 2014. Retrieved April 7, 2016. ^ Meza, Ed (December 22, 2014). "Studio Babelsberg Braces for $3 Million Annual Loss". Variety. Penske Media Corporation. Retrieved April 8, 2016. ^ a b Bloomenthal, Andrew (October 27, 2015). "Bridge of Spies: Spielberg, the Coens and Tom Hanks". Creative Screenwriting. Retrieved October 28, 2015. ^ Siegel, Tatiana (July 24, 2014). "Novice Screenwriter on Selling His First Script to Steven Spielberg: 'Exhilarating and Nerve-Racking'". The Hollywood Reporter. Retrieved November 5, 2014. ^ "Four Cast in Steven Spielberg's Untitled Cold War Spy Thriller". Dreamworks Studio. July 21, 2014. Archived from the original on October 6, 2014. Retrieved November 5, 2014. ^ Bahr, Lindsey (June 16, 2014). "Steven Spielberg's Cold War thriller and 'The BFG' snag release dates". Entertainment Weekly. Retrieved June 16, 2014. ^ "Amy Ryan, Alan Alda Join Tom Hanks in Steven Spielberg's Cold War found Thriller". variety.com. July 21, 2014. Retrieved July 21, 2014. ^ Ge, Linda (June 20, 2014). "Fox to Co-Finance Steven Spielberg's Cold War Thriller Starring Tom Hanks". The Wrap. Retrieved August 23, 2014. ^ CONNAUGHTON, CLARE (March 3, 2015). "Hollywood producer Marc Platt talks upcoming projects, Pitch Perfect and his time at Penn". The Daily Pennsylvanian. Retrieved March 4, 2015. ^ "Hollywood-Dreh in Deutschland: St James Place" (Press release) (in German). Berlin: Deutscher Filmförderfonds. December 8, 2014. Retrieved April 7, 2016. ^ "Steven Spielberg's Untitled Cold War Thriller is filming in Brooklyn this weekend". onlocationvacations.com. September 12, 2014. Retrieved September 14, 2014. ^ Frost, Mary (October 7, 2014). "DUMBO transformed for Spielberg Film". brooklyneagle.com. Retrieved October 12, 2014. ^ "Untitled Steven Spielberg Cold War movie films on Anchorage Street in DUMBO". news12.com. September 14, 2014. Archived from the original on October 6, 2014. Retrieved September 18, 2014. ^ megc. "Spielberg's "St. James Place" is Filming in Astoria". Weheartastoria.com. Retrieved September 19, 2015. ^ "Steven Spielberg spotted on the set of 'St James Place' in Astoria". onlocationvacations.com. September 16, 2014. Retrieved September 18, 2014. 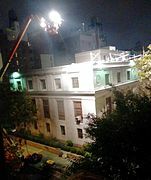 ^ "Spielberg's "St. James Place" is Filming in Astoria". weheartastoria.com. September 14, 2014. Retrieved September 18, 2014. ^ "PHOTOS: Tom Hanks shoots 'St. James Place' on Wall St". nydailynews.com. September 27, 2014. Retrieved October 12, 2014. ^ Bindelglass, Evan (September 29, 2014). "Tom Hanks, Steven Spielberg Film 'St. James Place' In Brooklyn Heights". brooklynnews.net. Archived from the original on October 15, 2014. Retrieved October 12, 2014. ^ Fink, Homer (September 29, 2014). "Spielberg Transforms Perfect Paws into a 1960s Dress Shop and He Will Make It Rain Monday Night in Brooklyn Heights". brooklynheightsblog.com. Retrieved October 12, 2014. ^ Croghan, Lore; Frost, Mary (October 7, 2014). "Tom Hanks lights up the night on Hicks Street". brooklyneagle.com. Retrieved October 12, 2014. ^ a b Barraclough, Leo (October 23, 2014). "Steven Spielberg to Shoot Scenes for 'St. James Place' in Poland: Report". variety.com. Retrieved October 24, 2014. ^ Blaney, Martin (October 1, 2014). "Race producers plan to re-team". SCREENDAILY. Retrieved October 10, 2014. ^ "Hier wärmt sich Hanks für den Kalten Krieg auf (Tom Hanks is warming himself up here for the cold war)". BZ Berlin. October 26, 2014. Retrieved October 26, 2014. ^ "Glienicker Brücke als Filmkulisse". Berlin Steglitz-Zehlendorf. October 6, 2014. Retrieved October 10, 2014. ^ "Pressrelease". Medienboard Berlin-Brandenburg. September 29, 2014. Retrieved October 10, 2014. ^ "Agentenaustausch an der Glienicker Brücke". Tagesspiegel. November 19, 2014. Retrieved November 26, 2014. ^ "Pressrelease". Studio Babelsberg. November 18, 2014. Retrieved November 26, 2014. ^ "Dreharbeiten - Merkel besucht Spielberg und Hanks auf Glienicker Brücke - Berlin - Aktuelle Nachrichten - Berliner Morgenpost" (in German). Morgenpost.de. November 28, 2014. Retrieved September 19, 2015. ^ "Spielberg to shoot spy thriller in Wroclaw". thenews.pl. October 22, 2014. Retrieved October 24, 2014. ^ "Action! Spielberg filming U-2 movie at Beale". appeal-democrat.com. December 18, 2014. Retrieved January 10, 2015. ^ "Productions on Kodak Film | Motion Picture Film". www.kodak.com. Retrieved February 29, 2016. ^ a b "Spielberg's Airtight "Bridge of Spies"". newyorker.com. Retrieved December 28, 2015. ^ a b c d e "Bridge of Spies". historyvshollywood.com. Retrieved December 29, 2015. ^ a b c d e "I spy dramatic licence under Bridge of Spies". theguardian.com. Retrieved December 29, 2015. ^ a b "Bridge of Spies:Goofs". imdb.com. Retrieved December 30, 2015. ^ Stellabotte, Ryan (October 16, 2015). "Metadiplomat: The Real-Life Story of Bridge of Spies Hero James B. Donovan". Fordham News. Retrieved August 5, 2017. ^ Ehrmann, Eric (November 4, 2015). "Hooray for Hollywood!". Russian International Affairs Council. Retrieved November 9, 2017. ^ a b Dougherty, Ryan (October 21, 2015). "Economist Frederic Pryor Recounts Life as a 'Spy'". News & Events. Swarthmore College. Retrieved November 22, 2016. ^ Bullock, Paul (June 6, 2015). "Bridge of Spies poster revealed". From Director Steven Spielberg. Retrieved June 6, 2015. ^ Gettell, Oliver (June 5, 2015). "'Bridge of Spies' trailer: Spielberg, Hanks tackle Cold War intrigue". Los Angeles Times. Retrieved October 27, 2015. ^ a b c Labrecque, Jeff (March 18, 2015). "Steven Spielberg's Cold War thriller gets a title, but John Williams drops out". Entertainment Weekly. Retrieved March 19, 2015. ^ Keegan, Rebecca (October 9, 2015). "Spielberg, Hanks and Rylance talk about the Cold War, geopolitics and 'Bridge of Spies'". Los Angeles Times. Retrieved December 10, 2015. ^ Hammond, Pete. "As New York Film Festival Opens, How Is Oscar Race Taking Shape?". Deadline Hollywood. Retrieved September 27, 2015. ^ "Spielberg-Coens Drama 'Bridge of Spies' Gets New York Film Festival Premiere". The New York Times. Retrieved September 27, 2015. ^ Tapley, Kristopher (October 4, 2015). "'Bridge of Spies' Could Bring Steven Spielberg a Step Closer to an Oscar Record". Variety. Retrieved October 26, 2015. ^ McNary, Dave (June 16, 2014). "Tom Hanks-Steven Spielberg Cold War Thriller Set for Oct. 16, 2015". Variety. Retrieved June 6, 2014. ^ "'The Martian' may lose top spot in crowded weekend at box office". latines.com. ^ Brad Brevet (October 15, 2015). "Forecast: 'Goosebumps', 'Spies' & 'Crimson Peak' Jostle for Audience Attention". Box Office Mojo. Retrieved October 16, 2015. ^ Anthony D'Alessandro (October 14, 2015). "'Goosebumps' Set To Freak Out, But 'The Martian' Could Scare It Away – Box Office Preview". Deadline Hollywood. Retrieved October 15, 2015. ^ Rebecca Ford (October 16, 2015). "Box Office: 'Crimson Peak' Creeps to $855K, 'Goosebumps' Raises $600K Thursday Night". The Hollywood Reporter. Retrieved October 16, 2015. ^ Scott Mendelson (October 17, 2015). "Friday Box Office: 'Goosebumps' Tops With Scary Good $7.4M, 'Crimson Peak' Nabs Scary Bad $5.2M". Forbes. Retrieved October 18, 2015. ^ a b "'Goosebumps' Raises Hair At The B.O., While 'Crimson Peak's Recedes". Deadline Hollywood. ^ "Bridge of Spies (2015) - International Box Office Results - Box Office Mojo". www.boxofficemojo.com. Retrieved December 10, 2016. ^ Roeper, Richard. "'Bridge of Spies': Spielberg Finds the Thrills, Action in Cold War Crisis". Chicago Sun Times. Archived from the original on December 16, 2015. Retrieved December 29, 2015. ^ Phillips, Michael. "'Bridge of Spies' review: I'll trade you one Soviet spy for..." Chicago Tribune. Retrieved December 29, 2015. ^ "Steven Spielberg's superb Bridge Of Spies pits Tom Hanks against the Cold War". The A.V. Club. Retrieved November 17, 2015. ^ Scott, Mike. "'Bridge of Spies' movie review: Steven Spielberg, Tom Hanks reteam for Cold War drama". New Orleans Times-Picayune. Retrieved December 29, 2015. ^ Jones, Preston. "Movie review: 'Bridge of Spies'". Fort Worth Star-Telegram. Retrieved December 29, 2015. ^ "Bridge of Spies". Rotten Tomatoes. Retrieved December 25, 2018. ^ "Bridge of Spies reviews". Metacritic. Retrieved November 25, 2015. ^ Grieving, Tim (October 17, 2015). "When John Williams Can't Go, Whom Does Spielberg Call? Thomas Newman". NPR. Retrieved October 26, 2015. ^ "'Bridge of Spies' Soundtrack Details". Film Music Reporter. September 30, 2015. Retrieved October 6, 2015. Wikimedia Commons has media related to Bridge of Spies (film). This page was last edited on 15 April 2019, at 02:16 (UTC).